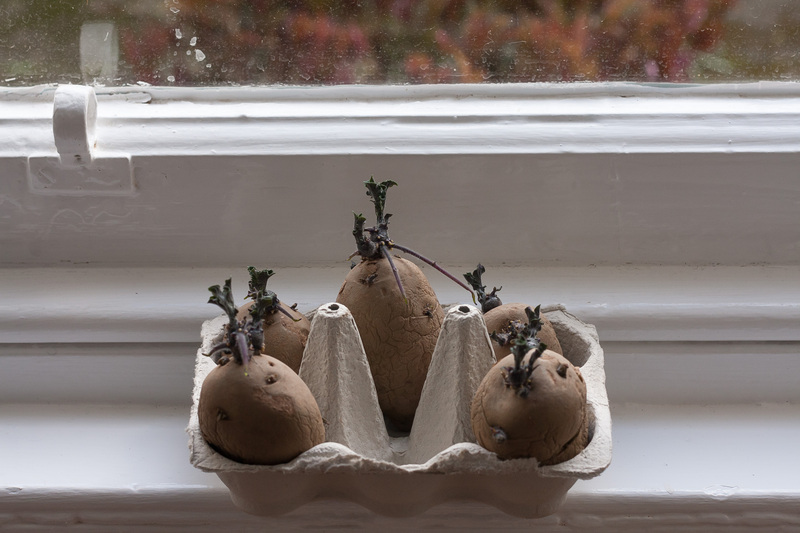 My seed potatoes have been ‘chitting’ or sprouting on the sitting room windowsill for the past 5 weeks. In that time they have developed shoots of 1-2cm, and in some cases roots. Now it is time for me to plant out my potatoes in pots. A fortnight ago I bought a very large tub for this purpose. It has no indication of capacity marked on it but at a guess it’s 30 litres. Since each potato plant will require 10 litres, this pot should fit three of the five seed potatoes I’ve been chitting. (The other two will go into an unused tub that I am going to expropriate from the shared back green). 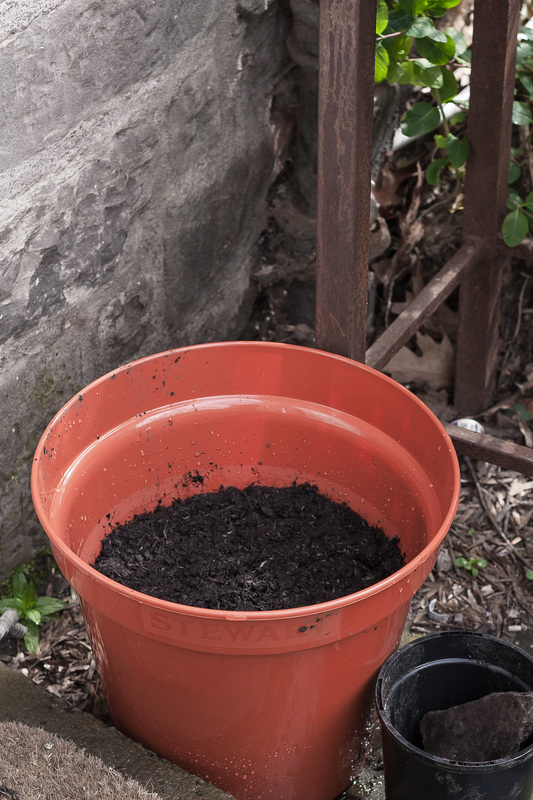 To aid drainage, I placed stones and brick pieces in the bottom of the tub; polystyrene can also be used for this purpose, but I would avoid this in a pot in which you are growing food in case chemicals leach out. Although it may sound fussy, I also cleaned the stones first with soap and water as potatoes are very prone to disease and it is a good idea to take careful steps to avoid inadvertent transmission of viruses and pests in to the soil where they are to grow. Once the stones were in place at the bottom, I added about 10cm of multi-purpose compost to the tub. I then placed the three seed potatoes, shoots upwards, on to the soil, and added a scattering of slow-release plant food. Next I topped up the soil another 10 cm so that the potatoes, shoots and all, were completely covered. This has left the top third of the pot free for ‘hilling’ up or ‘earthing’ up the soil around the shoots when they appear. Now for watering. Just think how much water is contained in just one potato tuber. Well, the pot is eventually going to contain (hopefully) dozens of tubers, and all that water must come from somewhere: my watering can, that’s where. 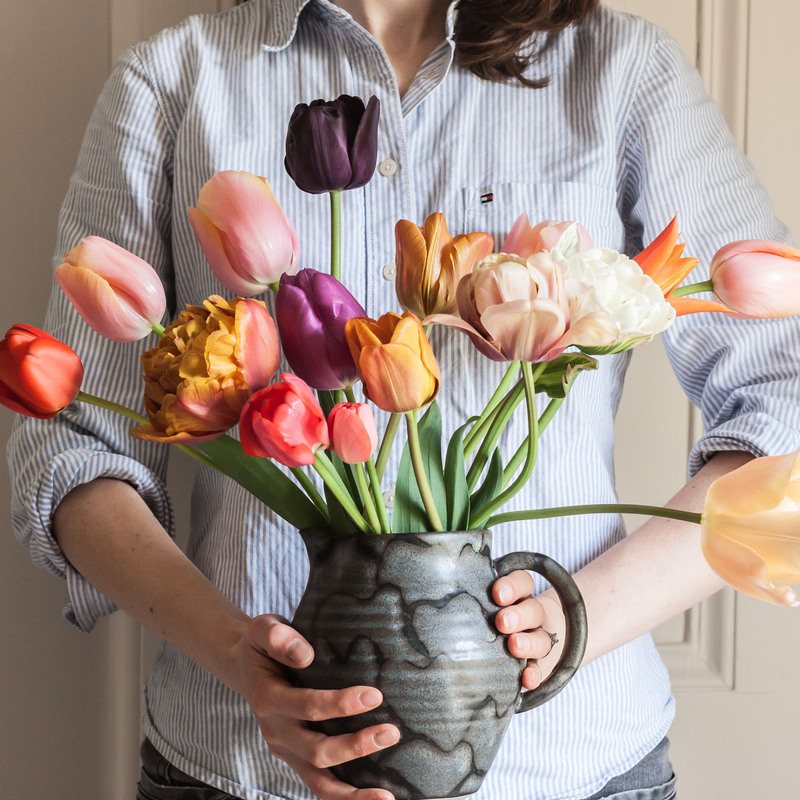 Although it rains a lot in Edinburgh compared with the south of the UK, I am not going to rely on rain to provide enough as the pot is going to be partially sheltered from rain by the tenement. Anyway, the forecast is for a dry weekend; I’ll be watering this pot at least every other day. Now all I have to do is wait for the shoots to appear, and then top up or ‘hill up’ more soil around them again. 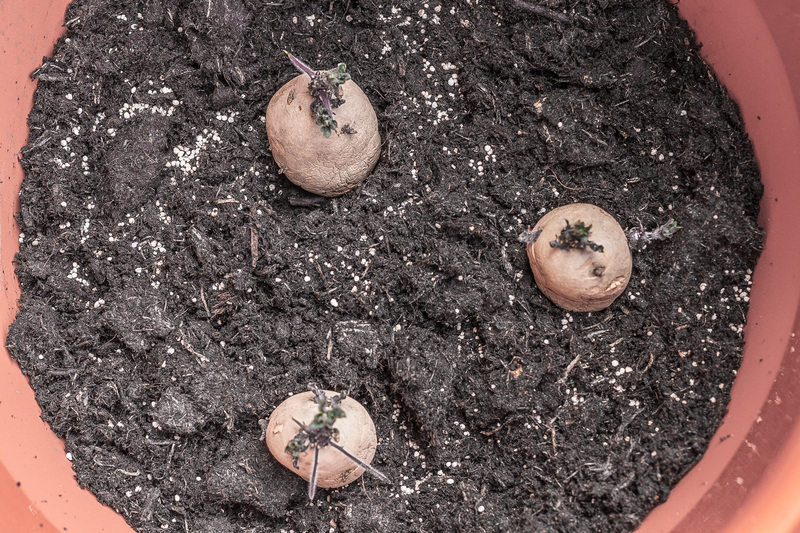 This will gradually increase the growing space, and prevent any potatoes from becoming green.